Having successfully formed a big band to play and record the music of The Terry Gibbs Dreamband, Skelton/Skinner next pursued another ambition to feature key lead players in a more intimate setting. They chose therefore to follow a tradition amongst Ellington and Basie alumni for forming and recording away from the big band under their own names but with the unmistakeable influence of their respected “governors” ever present in the feel of the ensemble and choice of material. The arrangements, all by Colin Skinner, are tailored around the soloists. Each player celebrated for the quality of their work in all of the country’s top bands. Mike Lovatt, Gordon Campbell, Colin Skinner, Connor Chaplin and Matt Skelton are all an important part of the John Wilson Orchestra phenomenon recreating the music of the Hollywood era. 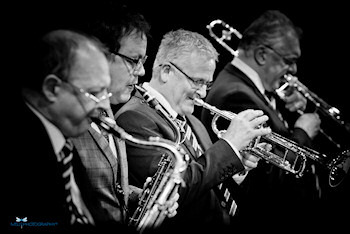 In addition Lovatt and Campbell are lead players with the BBC Big Band, Skinner with the Back To Basie Orchestra. Brown regularly tours with Stacey Kent and Skelton was recently invited to the States to perform with an orchestra accompanying Seth McFarlane. Alan Barnes is a mainstay of the jazz scene both as a guest soloist with the likes of Ken Peplowski and Warren Vache and when writing and directing his own groups in a series of projects such as “A Jazz Christmas Carol”. Rob Barron’s “What’s In Store” was released to critical acclaim in 2016 and his group has appeared as support for Louis Hayes and Kenny Barron.